The Boardroom Apprentice pilot is a programme that provides training and support to those wanting to serve on a board. It aims to bridge the gap between a person’s aspiration and their reality, by providing opportunities that we wouldn’t have through our normal work and life. The programme opened for recruitment in May 2017 and received over 200 applications. 29 Boardroom Apprentices were matched to 24 host boards from across the public and third sectors including the NIHE and Supporting Communities. The programme is built on three key learning pillars – a practical hands-on 12-month board placement, the transfer of knowledge and understanding through a suite of training modules and the provision of a board buddy to guide and support us throughout the process. As an employee of the NIHE, I was thrilled to see such willingness to embrace innovation from my own turf. I feel extremely lucky to have been placed with an exceptional organisation, Supporting Communities. In my work as a Functional Trainer, I am very aware of the excellent work being done by Supporting Communities on a day-to-day basis because I refer to them during training sessions. For the next 12months, I will act as a board member of Supporting Communities without voting rights. I first met with Colm McDaid, CEO, in July who provided great insight into the work being carried out and how it impacts positively on our communities. 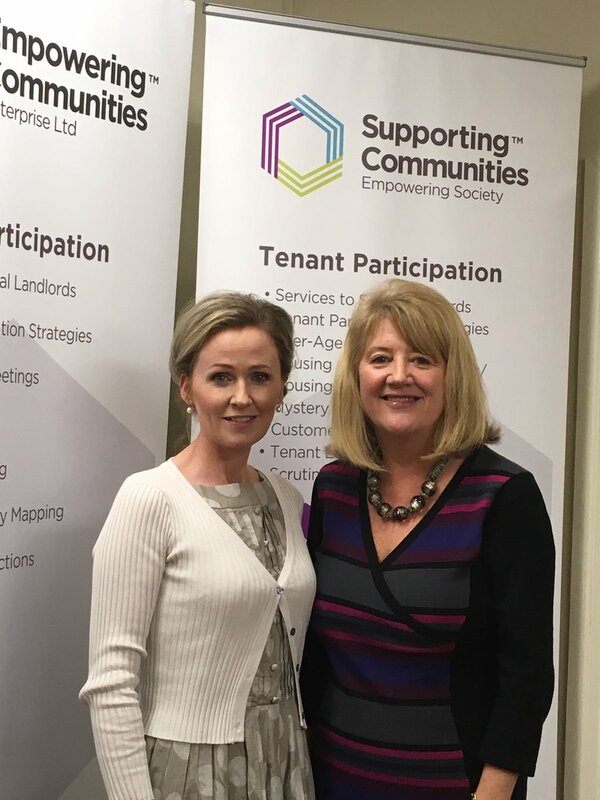 I was also paired with a fabulous ‘board buddy’, Lorraine Campbell, a former NIHE colleague and Chair of Supporting Communities. Over the coming months, both Colm and Lorraine supported me while I settled into my new position. Throughout the year I have attended training sessions and board meetings. This experience has provided me with the opportunity to serve and to get experience being a board member with the aim of applying for board positions in the future. With support from Eileen Mullan, founder of Strictly Boardroom and the Boardroom Apprentice, I was able to break my goals down into little steps. I was able to build on my strengths and learn my weaknesses and work on those also. I learned so much through the training sessions and board meetings. This experience has inspired me and helped me to navigate the gap between where I was and where I wanted to be. Each module has provided a range of building blocks to support me now and in the future. It has taken a holistic approach, focusing on building the individual. This pilot has been delivered on goodwill from everyone involved, each person taking time from their already busy schedule to support me. For that, I will forever be grateful. With each meeting and training session, I have become more confident in my ability and skills showing me how realising and releasing my potential can impact positively on inspiring organisations. I now have the confidence and support to get involved with and give back to our great community. Eileen Mullan with some of the apprentices. This session focused on the expectations and values that underpin the programme and its vision. It set the baseline of a collective understanding of what is expected from board members in giving their time and sharing their skills. We explored the need for understanding our own individual responsibility and the commitment required, not just to the programme, but also as a future board member. We discussed the importance of prioritising time and energy. It’s not just about committing to training days and board meetings, it’s about being wholeheartedly passionately giving your time to something that matters to you. This fire will push you to take time for the reading material, the board minutes, the phone calls to talk about the minutes because you don’t understand them, the presentation preparation and everything in between. You’ve got to give this 100%, anything less is just a shame. This training session focused on psychometric research and behavioural studies. It is rooted in the concept that who you are today is the emergence of your behaviour, genetic makeup, and life experiences. It helped me to understand the way people think, behave and communicate and how I can apply this to myself and others throughout my career. This training centered on the importance of good governance. It focused on the importance of acting in the best interest of the organisation, ensuring I understand my roles and responsibilities of being a board member, and also the processes that guide organisations to ensure we comply with best practice and statutory obligations. We even got a spread in the Ulster Tattler!! Next time I’m aiming for the front cover. This session was all about communicating, formulating, asking and answering questions. It provided information on public speaking and communicating effectively with colleagues and customers. I loved this session because it broke down the barriers of what we think board members are. They are just people! People like you and I that want to give back to our community. Once you have the confidence to stand up or sit at the table, opportunities open up everywhere. I also attended the annual Governance and Leadership conference. NIHE’s CEO Clark Bailie spent some time discussing the changing face of the NIHE and how we are working more closely with community organisations to make our communities stronger. I was very lucky to have breakfast with the current Interim Head of the Civil Service, David Sterling. We talked about our current political and economic environment and the importance of our communities working together for a better future. Some of my colleagues and I, along with Eileen Mullan, provided a roundtable discussion on Diversity within Boardrooms. We spent time pitching the pilot and emphasising the importance of succession planning and skills training for our future leaders. We talked about the importance of opening opportunities but more importantly, opening our minds. I also attend the FIT for Future conference delivered by my host organisation, Supporting Communities, the NIHE, and the Central Housing Forum. This conference focused on the use of digital technologies and social media in moving our communities and organisations into the future. The event featured several excellent speakers from across the water and I gained insight into how other organisations are doing things differently - and how I can pinch their ideas! This session focused on the tricky information – numbers and accounts - imperative skills to have when sitting on a board. It provided an understanding of key financial terminology, annual reports, and accounts. It also highlighted board members’ responsibilities around finance. I brought along Supporting Communities most recent Annual Report, which allowed me to translate the learning directly to my host organisation. Supporting Communities happened to have their AGM the following week so I was very much aware of what was ahead and it helped me make sense of the numbers. This final learning session focused on tying everything together. In a group, we had to deliver a presentation outlining key governance issues from a case study along with future recommendations. This session showcased our communication & presenting skills and the knowledge we have gained along the way. The Boardroom Apprentice is based on the idea that each one of us will go on to apply for and be successful in board positions in the public or third sectors. This wonderfully diverse group of people came together because we are motivated to serve. I personally became involved because I have an interest in the housing sector. I want to develop my skill set and learn so that I can positively impact this sector. I believe that everyone deserves somewhere to call home. It is difficult to maintain a job without a home. It’s difficult to maintain a relationship without a home. Everything is difficult without a home. I believe that housing is the heartbeat of our communities. It’s about building homes and communities, not just houses. It’s about soul, not soil. If we get that right, our communities will thrive. If you think you might like to be a Boardroom Apprentice, you can look out for future programmes at www.strictlyboardroom.com.